Edge computing, computer vision, and cobots will have a huge impact on industrial manufacturing in the coming year and beyond, according to a new report out by CB Insights. 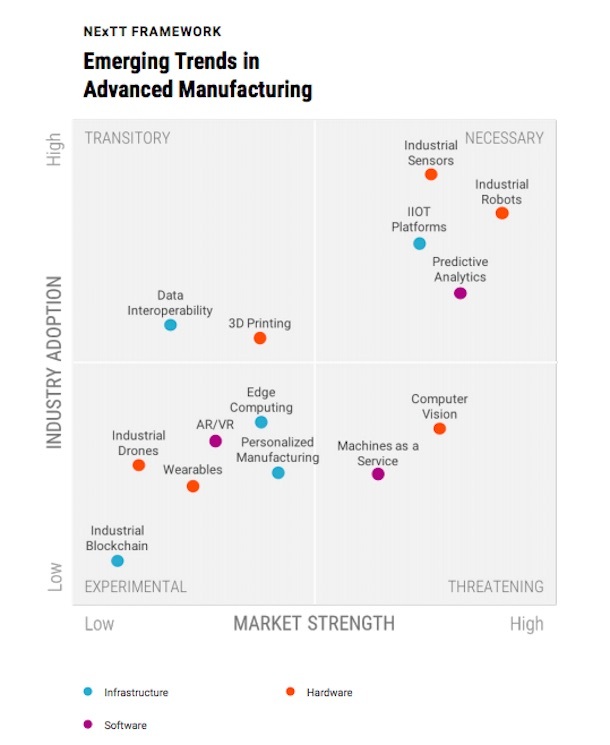 The report delves into tech trends facing the industrial and manufacturing world and places them into the usual analyst firm quadrants. I don’t want to dig into CB Insights’ particular methodology (please feel free to download and read the report for that), but for those with little time, I’ll classify the tech into things that are uncertain and potentially disruptive and things that sound super high-tech, but will happen and generate revenue. Let’s start with the tech that we know we’ll need and that we know will generate revenue for providers. In this category, I’m most interested in five different technologies: edge computing, blockchain, and wearable computing. They are all things I’ve seen in action at various events and am confident will change the manufacturing and industrial world in the near future. Edge Computing: I’ve spent thousands of words on this topic, so my readers are likely familiar with the concept of moving computing and processing closer to the sensors and manufacturing process. The report focuses primarily on latency benefits, but I think most companies are also concerned about security, IP theft, and even bandwidth costs. However, the report did share the surprising estimate from McKinsey that of the roughly $500 billion in growth projected for IoT solutions from 2017 to 2020, a full quarter of that will be spent on edge computing. Industrial Blockchain: Yes, I know we’re all so over the blockchain as it relates to cryptocurrencies, but as I’ve said for the last three years, the technology also provides a scalable and distributed system of accountability that’s far more interesting than the latest price of Bitcoin. Recall that one reason folks are excited about edge computing is that executives are worried about IP theft. Having a blockchain-based, immutable ledger available to track who has access to certain files or data is one way to control that. It’s also a potential way to build credibility into sensor inputs, which might help prevent hackers from tampering with sensor data. And when it comes to supply chain use cases, the blockchain has already been adopted by a variety of companies, such as Walmart, Tyson, and mining giant BHP. Wearables: This one feels the most inevitable and also the most distant. Industrial wearables can encompass sensors to track employee health and focus on the job as well as exoskeletons that can help people lift more or better handle tough physical environments. The technology is getting really good in this area, but the regulations, data, and employee and union confidence needed to justify the costs of such systems are lagging. However, what’s going to drive some of this technology to adoption will be climate change, as companies try to protect workers in increasingly harsh environments, and the adoption of collaborative robotics, another trend the report digs into. Such “cobots” are basically robots that are moving out of the isolated areas of a manufacturing facility into closer proximity with humans. As this occurs, people will need sensors or perhaps more protective gear to ensure their safety while working with robots. Augmented Reality: Despite the hype around virtual reality in the consumer realm, augmented reality (AR), where information is overlaid onto the real world using special glasses or displays, is already in use. Organizations such as Tetrapak and the U.S. Army are using Microsoft’s Hololens, and I’ve personally spent time at a Honeywell user event changing out an industrial process control box in a rack while being guided by augmented reality. The key will be moving AR from demonstration to actual manufacturing. To do this, headsets will have to be lighter and more power efficient. I also think we’re going to have to experiment with new interfaces. There are several more technologies in this category, which CB Insights dubs “experimental.” The other set of technologies I want to highlight from this report are those that CB Insights calls “threatening,” and I think of as uncertain and disruptive. Unsurprisingly, I’ve actually written a bit about these as well. Machine Vision: Machine vision is already being used in the oil and gas industry for flare detection, and in production lines to detect problems with parts coming off the line. As machines get better at seeing and understanding what they see, robots in manufacturing facilities will get much more powerful. The challenges here include figuring out how to package machine vision for battery-powered or edge devices, and also how to shorten the amount of time it takes a machine vision algorithm to identify whatever it’s supposed to identify. Machines As a Service: The idea here is familiar to anyone who has a Spotify subscription. Only now, take that on-demand model to expensive, industrial machines. Currently Rolls-Royce, GE, and Pratt & Whitney sell jet engines as a service, charging airlines for hours flown; Emerson even has a steam traps-as-a-service business for oil refineries. The opportunities here are numerous, but there are also a lot of risks. The sales model changes dramatically when trying to sell equipment as a service, for example, and in many cases customers aren’t eager to turn a capital expenditure into an operating expenditure, as buyers’ budget cycles are typically not set up for that model. Additionally, depending on who is offering the service, it can risk pitting one player in the manufacturing ecosystem against another. This is a longer-term trend to watch, however, and is by no means inevitable.